The Altar of Sacrifice of the Biblical Tabernacle. The bronze altar, brazen altar (Hebrew: מִזְבַּ֣ח הַנְּחֹ֗שֶׁת, mizbah hanne hōshet; Exodus 39:39 ), table of the Lord (Hebrew: שֻׁלְחַ֤ן אֲדֹנָי֙, shulchan adonai; Malachi 1:7,12 ) or altar of sacrifice, altar of burnt offering (Hebrew: מִזְבַּ֥ח הָעֹלָ֖ה, mizbah hā`ōlâ; Exodus 30:28 ) was an altar built for sacrificial purposes. The literal meaning of the Hebrew term מִזְבַּ֥ח, mizbēah is "place of slaughter" or "place of sacrifice". The altar was a central point of the religious worship. It had horns to which the animal to be sacrificed could be bound. This altar differed in construction, size, etc.. at different times. In the tabernacle the altar was situated right inside the courtyard upon entering the gate to the tabernacle. The altar was a hollow square, five cubits long, five cubits wide and three cubits high (Exodus 27:1-8 ). It was made of acacia wood overlaid with bronze. The altar had a horn on each of the four corners, so that the horns and the altar formed a single piece. In the Temple built by Solomon the altar of burnt offering was increased in size. It has become a square, twenty cubits long, twenty cubits wide and ten cubits high (2Chronicles 4:1 ). The altar stood in the outer court. Later on Uriah removed it from its regular place to make room for another altar, but finally it was restored to its place by Manasseh. In the Second Temple the altar was erected before the foundations of the Lord’s Temple had been laid (Ezra 3:3,6 ). It was erected on the place occupied by the former. After it has been desecrated by Antiochus Epiphanes, it was rebuilt by Judas Maccabeus, probably using unhewn stone. In this Temple the altar has become a square, fifty cubits long, fifty cubits wide and fifteen cubits high according to Josephus or a square thirty-two cubits long, thirty-two cubits wide decreasing slowly in steps till it was twenty-four cubits according to the Mishna. ↑ Tenney, Merrill C, ed. (1967). Pictorial Bible Dictionary. Grand Rapids, Michigan: Zondervan Publishing House. p. 31. ISBN 0-310-23560-X. ↑ 2.0 2.1 Birnbaum, Philip (1979). Encyclopedia of Jewish Concepts (Revised edition ed.). Brooklyn, New York: Hebrew Publishing Company. 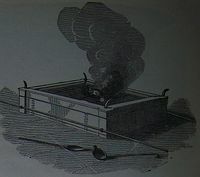 p. 348. ISBN 0-88482930-8. ↑ 3.0 3.1 Smith, William (1979). Smith´s Bible Dictionary. Nashville: Holman Bible Publishers. p. 14. ISBN 0-87981-033-5. ↑ 4.0 4.1 4.2 4.3 Unger, Merrill F (1988). Harrison, R. K.. ed. The New Unger´s Bible Dictionary. Chicago: Moody Press. pp. 48-49. ISBN 0-8024-9037-9. ↑ "The Brazen Altar". http://the-tabernacle-place.com/articles/what_is_the_tabernacle/tabernacle_brazen_altar. Retrieved 2013-07-19. ↑ 6.0 6.1 Douglas, J.D. ; Tenney, Merril C, ed. (1987). The New International Dictionary of the Bible. Grand Rapids, Michigan: Zondervan Publishing House. p. 37. ISBN 0-310-33190-0.